Courtesy of BeeswaxBeeswax’s founders, from left, Shamim Samadi, Ari Paparo, and Ram Rengaswamy. 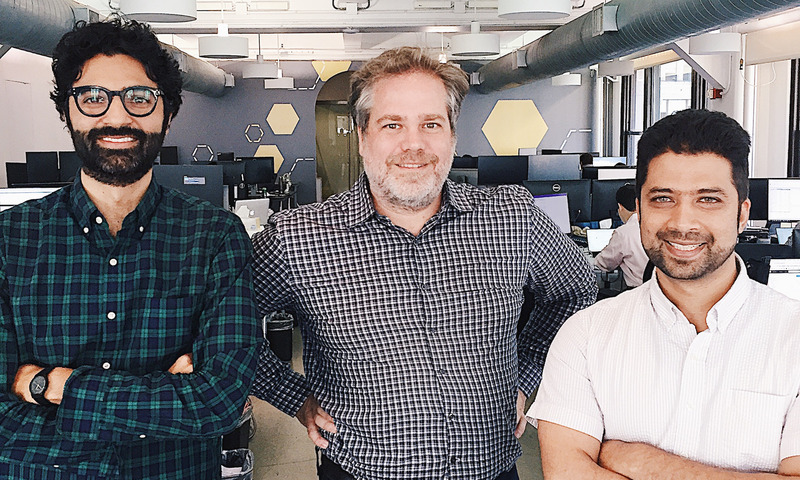 Three former Google executives founded Beeswax, an ad-tech startup that helps companies bid for ads in real time. The company sets up whiteboards in practically every room of its New York office, including the kitchen. Whiteboards have been a part of the company since it was founded in 2015, and they followed the executives as they moved from office to office. For the three founders of Beeswax, the journey from working at Google to leading their own startup has one common thread: whiteboards. The company, which pioneered a new way for marketers to bid for ads, is the brainchild of three former Google ad executives: its CEO, Ari Paparo, who more recently was an executive for Bazaarvoice and AppNexus; its chief technical officer, Ram Rengaswamy; and its chief product officer, Shamim Samadi. When Paparo first told Samadi about his idea for the company, Samadi said he went back to Google to try to convince Rengaswamy. “I immediately pulled Ram from his desk when I got back and whiteboarded it, talked him through it,” he told Business Insider. When the trio founded Beeswax in 2015, a whiteboard was the first thing they purchased as a company, Rengaswamy said. It followed them as they moved from their first office – which was actually just a single table inside another company’s space – to a series of WeWork offices as their New York City-based ad-tech company grew. “The funny thing was, as we moved from place to place, it was always like, Ram and I walking down the street with a big whiteboard,” Paparo said. Now, Beeswax has its own office that can barely contain its rapidly expanding workforce. Whiteboards are popping up in unexpected locations. Apart from office supplies, there are other signs of Beeswax’s impressive growth. The company, which makes software that helps companies bid for ads online in real time, has 75 clients, including Foursquare, Overstock, and Legendary Pictures. Their revenue from 2017 is estimated to be about $US25 million. The executives say they employ about 55 people, with plans to move to a new office and expand to 67 employees by the end of the year and to grow to 100 by the end of next year. That’s a far cry from that first space they had back in 2015. For the first few weeks of the company’s existence, the founders worked inside the office of Chartbeat, a content-analytics company, after a friend of theirs at the company let them use the space free. From there, the company bounced from one WeWork space to another – “there was a brief period of time where we couldn’t afford windows” at one of the five they rented, Rengaswamy said – until finally landing at their latest space last year. The presence of whiteboards in practically every room reflects the startup’s commitment to problem-solving, creativity, and collaboration.